Steve Anderson – Denco Dental Construction Inc.
As a general contractor in the Phoenix area, Steve Anderson tired of the bidding game around 20 years ago and identified an underserved niche that he would fill; that is, the building and remodeling of dental offices. Architects alone weren’t always the answer, Anderson remembers. Often, their designs didn’t take into account the importance of an integrated, symbiotic operation. The same went for the importance of aesthetics. The wrong surroundings heighten the stress of patients who already are wishing they were elsewhere. All dental offices aren’t alike, either. This is important to consider, especially in multicultural Arizona. Budgets, too, must be taken into account. Anderson had these ideas and more when he launched his Tempe-based company, Denco Dental Construction Inc., which has now built over 500 customized dental offices in Arizona—“all unique,” he says. His firm is the only general contractor endorsed by the Arizona Dental Association and boasts an A+ rating from the Better Business Bureau. As Anderson explains, Denco partners with the dentist in designing and building that customized clinic. Whether it’s a start-up, a remodel or a relocation, Denco takes into account the dentists’ dream for their office and guides them through the process to make their dream a reality. Denco will work with architects and designers, as well. 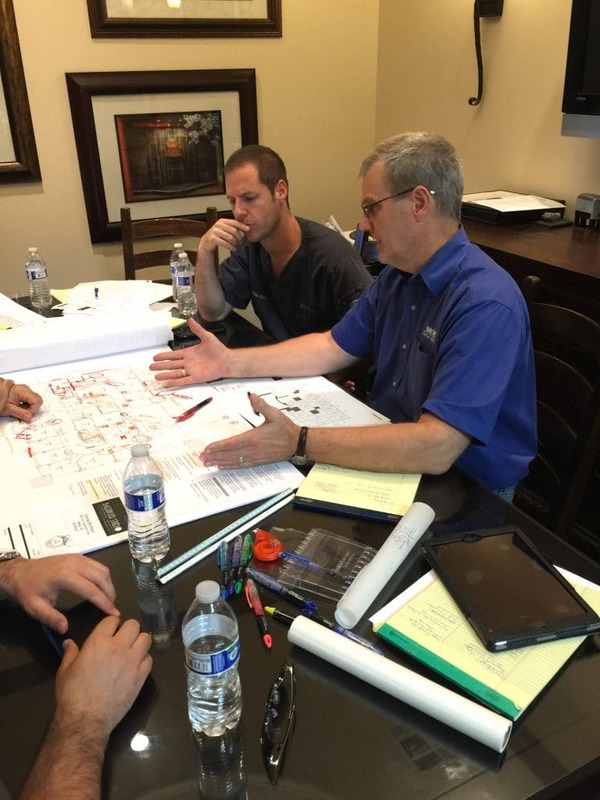 The costs are factored in each phase so there are no surprises or hidden costs when the project reaches fruition. When a Phoenix dentist, Dr. Anthony Herro, needed a new location to accommodate the growth of his practice, Denco converted an old bank into an attractive 4,355 square-foot, five operatory office with a bright, brick interior and welcoming environment. Mindful of the anxiety that a dental visit can entail for children, Drs. Jeffrey Brownstein and Elliott Bailey wanted their West Valley Pediatric Dentistry & Orthodontics in Glendale to be a place the little ones wouldn’t dread approaching. With Denco’s help, they now run a four closed-operatory, four open-bay clinic that includes a jungle motif with plastic animals, including a giraffe sitting on a waiting room bench. “We still get patients commenting all the time that our office is the nicest they have ever visited,” Dr. Bailey says. Desert Ridge Pediatric Dentistry of Phoenix used a different theme to engage the children: outer-space décor that includes planets, stars and a space shuttle replica suspended from the ceiling. 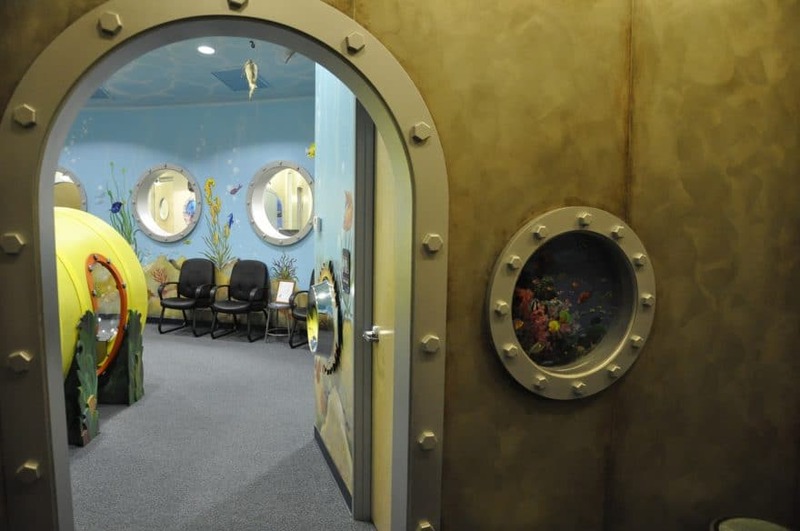 And while fish tanks are a common accessory in dental offices, Dr. Kyla Hollen, of Tucson, took her Southwest Kids Dentistry to another level. An avid surfer, Hollen’s walls are festooned with images of tropical fish, reefs and waves. Anderson can only wonder how much more at ease he would have been as a kid if such clinics existed. He, too, dreaded the twice-a-year checkup. The past 20 years, the anxiety level seems to have been lessened for all ages at hundreds of Arizona’s dental clinics. An easy-to-reach, rich-in-bullet-points 126-page paperback, released last year and available on Amazon, “Blueprints” outlines a step-by-step process for creating that unique user- and patient-friendly dental office. Anderson found the book necessary to write because just as a good dentist benefits from a patient’s referrals, Denco Dental Construction’s reputation has spread, appropriately enough by word of mouth, throughout the dental profession. Yet he finds himself in the enviable position of having to turn down opportunities elsewhere, and becomes philosophical about not spreading himself too thin. For just as a fruit tree can weaken from unpruned branches and excess foliage, so can a business if it takes on too much, Anderson writes on the Denco website. Identify priorities, he advises; when you make a commitment, stick to it, even if a seemingly more attractive opportunity comes along. He’s made that commitment to Arizona, not just to his dentist clients but to the dental schools where he sometimes lectures on the logistics of building that first office. “I can’t be everything to everyone; so many people say yes to everyone and wind up making nobody happy,” Anderson writes. “I find it much better to be selective and keep critiquing what I can do better. By managing work this way, I keep my clients happy while reducing my stress.